Alpine Climbing Harness: Alpine Climbing Harness should be light and simple in design, easy to put on and take off with gloves on, with positively foolproof locking features. Crampons: Crampons must fit boots perfectly; steel crampons with anti-balling and ability to toe point positively and safely into ice. Ice axe: Ice axe should be versatile light general purpose ice climbing axe not too aggressive. Ascender: Ascender or Jamar, a mechanical device used for ascending on a rope; must be suitable to be used with gloves or mittens. Multi-LED Head Lamp: Multi-LED Head Lamp and spare batteries are essential items, we do not recommend single bulb lights due to its low reliability and a single point of failure. Karabiners: Minimum 2 locking carabineers, 1 large and 1 small and 4 regular. Slings: One 3m (10ft) and three 2m (6ft). Masks, hoses, and regulators: Good quality for your safety. For under garments we recommend Merino Wool from Icebreaker because the company understands climbers and mountaineers needs and utilises the best quality material in the world. No other company can at this stage match Icebreaker quality. The quality in extreme conditions is essential for your comfort and safety. Merino wool is the finest wool and it matches cotton with softness and polypropylene with insulation and breath-ability because it takes moisture away from the body and keeps you dry and warm. Due to its natural nano-tube construction it has antibacterial properties, so it stays usable for much longer. 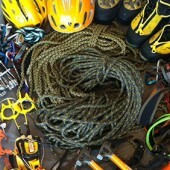 It is slightly more expensive then polypropylene so is climbing and trekking. One polar fleece pullovers, medium weight. One very warm goose-down (duvet) jacket with hood or a down/duvet suit if you prefer, for high altitude use. Note: Your clothing should be kept dry using waterproof stuff sacks, bin-liners, or large plastic bags. One medium rucksack (50-70 litters / 3000-4500 cubic inches, can be used for airplane carry). Two large (120 L / 7500 cubic inch) duffle kit bags for clothing and equipment. Must be durable for use on pack animals. For high altitude, one down (duvet) sleeping bag (rated to –35 C (-30 F). In the high camp, you can sleep in your down (duvet) clothing inside your sleeping bag;. At least 3 closed cell foam mats for use in base camp and high altitude, which can be purchased in Kathmandu inexpensively; we do not recommend inflatable mats due to high probability of accidental puncture. Personal prescription medications. Please let your leader know about any medical issues before the climb. One skin blister repair kit. medications are inexpensive and readily available in Kathmandu with no doctor's prescription;. One small bottle of anti-diarrhea pills (Imodium). One small bottle of anti-headache pills. One course antibiotics for stomach infection, available locally at chemist shop or pharmacy with no doctor's prescription. One course antibiotics for chest infection, available locally at chemist shop or pharmacy with no doctor's prescription. One small bottle anti-altitude sickness pills: Diamox, Acetylzolamide. For more about this medication, please contact us. Do not bring sleeping pills. They are a respiratory depressant non compatible with high altitude physiology. One small bottle of water purification tablets or water filter. Our skilful cooks will prepare 3 delicious hot meals and plenty of drinks each day in base camp, as well as in camp 2 on the mountain. This meals will consist of soup, local cheese & sausage, biscuits, dried noodles, potatoes, rice, porridge, butter, dried and tinned vegetables, fruit, meats, and fish, tea with milk and sugar, powdered juice drink, and drinking chocolate. Our Sherpas will be carrying this food to the higher camps. We ask only members to bring 5 dehydrated meals (freeze-dried dinners) for their summit attempt. On summit day you will be at high elevation and you will be affected by the altitude with very limited appetite and for period so it is important to have flavours you most likely will consume. We cannot cater for specific personal and uncommon foods and flavours. If you have any unusual, non-standard or specific personal, cultural or religious dietary requirements, which can only be satisfied with imported product, we ask you to bring your own imported daily snack and energy foods. We do not provide “snack” food such as chocolate or "energy-bars". We ask that you bring or buy your own "snack" or daily cold energy food in Kathmandu or in home country. From our experience 3-6 kilos/6-12 pounds is a sufficient amount. A growing variety of imported foods such as European and American cheeses, chocolates, biscuits, cookies, nuts, and locally made power-bars are now available in Kathmandu, at realistic prices. However, imported brands of power bars, GU, re-hydration drinks, dehydrated food, "freeze-dried meals", imported cheese and sausage may not be available. If you want these items, you must bring them from your home country. Many of our members, especially Britons, Europeans, and Australians with tiny baggage allowances, now purchase their daily snacks in Kathmandu. Our schedule in Kathmandu allows sufficient time for shopping. Credit cards, Bank/ATM/Cash machine cards for use for withdrawing funds from cash machines (bring a photocopy of your cards), traveler's checks, etc. Please be sure and bring your patience and try to keep an open, relaxed, positive and friendly attitude as travelling in this part of the world may be very different than what you are used to, but things always seem to fall into place at the last moment. Note: This is not an exhaustive list. Please submit other equipment concerns and suggestions. On Everest, although some climbers wish to try to summit it without supplemental oxygen, most of members would prefer to have oxygen available. We only allow members to climb Everest with the supplemental oxygen available. How much oxygen one requires is an individual decision; some people want 1 bottle, others want 12; our only requirement is that every expedition team member must have at least one oxygen bottle available for personal use, which will constitute at the minimum an emergency supply for climber to get down to at least camp 4. Our experience indicates five oxygen bottles is usually a sufficient for average climber. All of the equipment is guaranteed to work well together, and it is easy to use, with simple threaded and snap-on fittings which require no tools. We have a 40% buy back policy on unused oxygen bottles, and masks, hoses, and regulators in good condition. Note: You may have to carry some or all of your own oxygen on summit day, as well as up and down the mountain. If possible, the groups sherpas will help stock the high camps, as well as share in carrying extra bottles during summit attempts. If you are concerned you might not be able to carry your own oxygen, you may wish to hire a personal sherpa. If you want to climb Everest, you're going to have to be in extremely good physical shape. Basic fitness training should start well in advance, at the minimum of 12 month with main emphasis on cardiovascular training, assuming you are an amateur athlete and you are fit for strenuous athletic exercises. The main reason for your cardiovascular training is to increase your heart-lung oxygen capacity, so you can deliver sufficient amount of oxygen to your muscular and brain tissue in extremely low partial oxygen pressure. Acclimatization to high altitude is both a function of cardiovascular capacity as well as your personal physiology adaptation capacity, which you will only find out, when you above 8000m. Small percentage of people no matter how fit they are at sea level will not be able to adapt to high altitude, generally however the fitter you are the better your body will be able to cope with the altitude. The primary concern of mountaineers as altitude increases is the partial oxygen pressure decrease. There is a fine balance of pressure between your internal oxygen pressure in your lungs and the outside world, which allows your lungs to absorb the oxygen and deliver it to your blood stream, it is called partial oxygen pressure. With the altitude the outside pressure drops, while the internal pressure remains constant and at about 9000m you will not be able to absorb any oxygen at all with predictable outcome despite the amount of oxygen in the air is the same. Our system has evolved at the sea level, where it functions perfectly and it doesn’t at high elevation. The human body has however phenomenal ability to adapt given appropriate conditioning and time, it is called acclimatization. Low levels of oxygen in the blood can cause number of conditions such as Acute Mountain Sickness (AMS), which is easily treatable and reversible condition but it can lead to more serious conditions such as High Altitude Celebral Edeme (HACE) and High Altitude Pulmonary Edema (HAPE). Low level of blood oxygen can lead to the body thermal inefficiencies causing frostbites and hypothermia. Other condition caused by the effects of high altitude is thrombosis or embolism. At high elevation due to lower UV absorption by the atmosphere and reflections from the snow there is high risk of sunburn. The other hazards include broken bones due to falls, avalanche, ice fall or rock fall.